Upgrade Active Directory Password Management Software via Service-Pack Page - ManageEngine ADSelfService Plus. 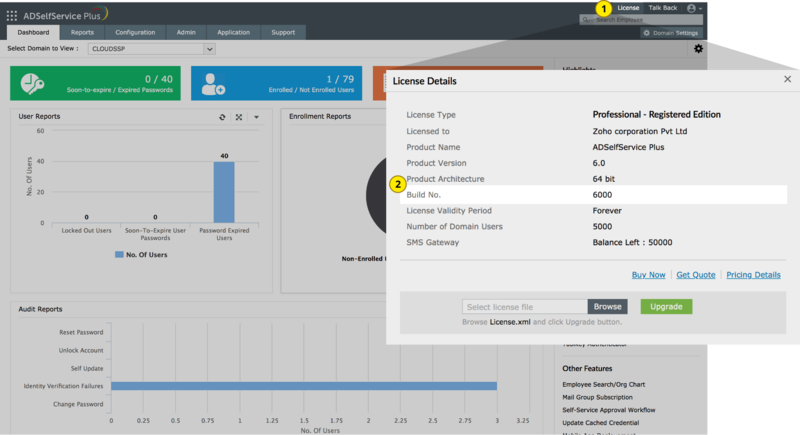 Log in to the ADSelfService Plus Plus web client, and click the "License" link in the top pane. You'll find the build number in the License Details popup. This is the build number of the currently installed ADSelfService Plus. If the product runs as an application, click on Start --› All Programs --› ADSelfService Plus --› Stop ADSelfService Plus. If the product runs as a Windows service, click on Start --› Run --› type "services.msc" --› Stop "ManageEngine ADSelfService Plus". 2Execute the stopDB.bat file under <ADSelfService Plus>\bin directory. 3Backup ADSelfService Plus by zipping the contents of <ADSelfService Plus> directory. 4If you are using an external database server (MS SQL or MySQL), then take a backup of the database also. If you are using MySQL server and have McAfee antivirus scanning the machine, then please pause the antivirus software till the update process is complete. 5Open Command Prompt and execute the UpdateManager.bat file under <ADSelfService Plus>\bin directory. 6Click Browse and select the PPM file that you have downloaded. 7Click on Install for the service pack. Depending on the amount of data to be migrated, the installation procedure may take a few minutes. Please do not terminate prematurely. 8Click Close and then Exit to quit Update Manager tool. If the product runs as an application, click on Start --› All Programs --› ADSelfService Plus --› Start ADSelfService Plus. If the product runs as a Windows service, click on Start --› Run --› type "services.msc" --› Start "ManageEngine ADSelfService Plus". Log in to the ADSelfService Plus web client. You can contact ADSelfService Plus Support at any time for assistance in updating ADSelfService Plus to the latest version.